Joseph Mallozzi's Weblog: May 12, 2011: Stargate: Universe, Beyond Season 2! What Might Have Been! May 12, 2011: Stargate: Universe, Beyond Season 2! What Might Have Been! The ending to Gauntlet that aired was different from the one originally conceived. Before the script was written, hell, even before the writers sat down to spin the actual story, the original pitch had Young and Rush as the last two men standing. With one, lone serviceable pod remaining, they argue, then make the decision to let fate decide. They flip a coin. Winner makes the sacrifice and stays out; loser goes into stasis. The coin flip is made and, as it descends, we FADE OUT, not knowing the results. One of the possibilities this particular ending set up was a season 3 opener which finds Rush, three years later, a little loopy from his time alone. As he goes through his daily maintenance of the ship’s systems, he converses with members of the crew who, it turns out, are hallucinations. Suddenly, the gate activates. A bewildered Rush hurries to the gate room in time to see Telford lead a rescue op through. Turns out, after several years, Earth finally acquired a means to dialing Destiny. Of course, the rescue turns out to be shortlived as it ends up being a hallucination as well when, in the episode’s final turn, we discover Rush in stasis (he was the one who lost the coin toss), evidently dreaming, while Young maintains the solitary existence as Destiny’s caretaker. As cool as the idea was, it was problematic for a number of reasons. First – sure, someone might go a little batty after spending three years with no human contact, but Rush? Even though it does turn out to be “all in his head”, I have a hard time imagining our antisocial Rush minding all that much being alone to explore Destiny, free of outside interference. The second problem was that, essentially, the episode was one big stage-weight – the equivalent to the “It was all a dream” short stories your third grade teacher, Mrs. Haversham, used to love so much. A third problem presented itself in the simple fact that this was to be the third season premiere and, as season premieres went, it was lacking in action. We discussed moving the stasis reveal to the end of the second act, then, maybe, the end of the first act, but this story still wasn’t working until we finally found the solution – which was to not do the story at all and make Eli the one who stays awake. After all, who better than Eli, the embodiment of our fans and viewers, to make the sacrifice and leave us with that final sense and wonder? So, that’s the way we wrote it. And now you want to know how we planned to write our way out of it. Does Eli fix the pod or does he somehow manage to access enough power to ensure his survival for the length of the jump? How long does the journey to the next galaxy end up taking? And what was in store for our crew after the jump? Search me! Unlike that imagined season 6 of Atlantis that never came to fruition (check out the AU season that might have been here: September 30, 2008: An AU Season 6! ), there were no inklings spun, no stories established, no ideas from the previous season that could be moved into the next. What we had, instead, were a few potential scenarios, vague notions of where we could go. So, no definite answers for you (sorry) which, as I said in yesterday’s blog post, isn’t necessarily a bad thing as it allows you, the viewer, to envision the ending you prefer. And, at the end of the day, the conclusion you come up with will be just as legitimate as anything I could throw at you. But, realistically, there are more than a few of you who go to movies and watch television shows so that you don’t have to make up your own damn ending! Well, for those of you, this entry hopefully gets you one step closer. Like I said, it doesn’t provide any definite answers but, in allowing you some insight into the possible scenarios we were spinning, it hopefully makes it somewhat easier to choose your own adventure. This was one scenario. Somehow, someway (sorry, don’t have the details but I’m sure the solution would have been all sorts of cool – right, Mr. Scalzi?) Eli manages to fix one of the damaged pods and joins the others in stasis. He awakens with the rest of the crew anywhere from three to one thousand years later. I jokingly pitched out a scenario in which the crew awakens from stasis with the horrible realization that Eli is not there to greet them and that the pods haven’t been fixed. As they mourn their friend, they unseal Chloe’s stasis pod only to discover both Eli and Chloe inside, spooning (Yes, I was kidding and, no, that wouldn’t fly)! Another potential scenario with no firm solution. Again, it would need to be something a little more clever than Eli awakening Rush three years later and informing him: “Yeah, I managed to reroute enough power to life support. How? Oh, I’ll tell you later.”. In my mind, the solution rested with the lone remaining shuttle. Given its independent system, Eli could reroute all of Destiny’s power reserves to maintaining life support with the closed confines of the shuttle and, perhaps, the sealed-off antechamber to the ship where he could store enough food to last him three years. Since this way-out solution would have Eli relinquishing his physical form (in essence, dying), it was an option reserved for a potential movie as we couldn’t imagine having our hero exist in this form for an entire season. It would allow him to reunite with Ginn (for another Eli/Ginn reunion scenario, read on) and allow the crew full control of the ship with Eli – who better? – as their eyes to all of Destiny’s systems. When Destiny comes up short and drops out of FTL hundreds of years from the next galaxy, rescue comes in the form of a branch of our descendants, an advanced military society that has mastered space flight and is now in possession of a massive armada. They save us but their motives turn out to be less than honorable as, it turns out, they have designs on Destiny. This was probably my favorite scenario as I loved the idea of a plausible human military force becoming our third season Big Bad. Rescue comes in the form of some alien race, maybe remnants of the Ursini or, perhaps, the blueberry aliens who – now armed with the information they mined from Chloe in Deliverance – finally seize the opportunity to take Destiny, something they’ve been trying to do for some time (At one point, we tossed around the idea of our crew coming upon the desiccated remains of an advance alien scouting party in one of the ship’s unexplored sections but, ultimately, decided against it because we wanted to maintain the idea that, despite repeated attempts, the blueberry aliens were unable to penetrate Destiny’s automated defenses and gain entry). There was also talk of salvation coming in the form of a completely new alien species (Brad’s uber-cool idea), possibly an energy-based race we unwittingly picked up during a refueling stop at a star. Eli starts glimpsing these entities and assumes, after three years by his lonesome, he is going nuts and hallucinating. Eventually, the aliens reach out to him and, being energy based, are able to provide the power needed to ensure Destiny complete its journey. And how long does the journey take? Oh, anywhere from three to roughly one thousand years. Smart money was on the minimal three year journey which would have allowed our crew to touch base with a fairly unchanged Earth. A ten year journey would have been more interesting in that it would offer up some great story possibilities as our crew inevitably try to reconnect with loved ones following a decade’s absence. Are they still alive? How have they moved on? What has changed in their lives? There was even talk of returning to an Earth in the midst of a multi-year war with the Lucian Alliance. For my part, I preferred the idea that our characters don’t know how long they’ve been in stasis and, when they contact Earth, are horrified to discover it’s been 100+ years. Their loved ones are long-gone, the lives they led distant memories, and they must adjust to a world very different than the one they left behind. And what was in store for our crew once the jump had been completed? Again, a number of potential developments were floated. Initially, when we were thinking in terms of a third season, I very much liked the idea of Colonel Telford leading a resupply mission through the gate. Earth had finally secured a power source that would allow them to dial Destiny. Maybe it was a one-way trip because Destiny would still be ham-strung by the inability to dial Earth without explosive consequences or, on the other hand, Telford and co. bring the portable power source with them and allow some of the civilians to leave, establishing a stronger military presence on board. Later, when it became clear that a third season wasn’t in the cards, Brad floated the idea of two movies: The first would focus on a rescue op that would see several familiar faces (Carter, McKay, Daniel Jackson among the first few mentioned) coming aboard Destiny and, ultimately, helping our crew fend off the advances of the previously mentioned human military race. The second would have been a solo adventure that would have seen our crew finally completing Destiny’s mission (Sorry. No details available on this one. Brad and Robert had a mind-blowing idea for the series/franchise wrap-up and, in deference to them, I’ll keep my mouth shut and allow them to one day reveal their master plan). We probably would have found a cure for T.J.’s condition – but only eventually. I liked the idea of one of our main characters having to face her mortality, perhaps even exhibiting early signs of physical deterioration that forces their friends and loved ones to face the sad prospect as well. If we were going to cure her (and, again, that was the most likely scenario) I would have lobbied to play out T.J.’s battle with ALS over the course of a season at least. In similar fashion, I would have preferred to keep Park blind for an extended stretch as well. It’s something you rarely see on television and something I really wanted to emphasize in Gauntlet (when she comes up with the idea of using the shuttle as a decoy), that despite the loss of her sight, she can continue to be a strong and productive member of the crew. So who would T.J. have ended up with? Young or Varro? I don’t know. I honestly don’t think this would have ever been resolved. If it was up to me, she would have ended up with Varro. If it was up to Carl and most everyone else, she and Young would have lived happily ever after. In retrospect, it might have been better for the character if, in the end, she elected to say no to both and embrace her independence. What about Ginn and Perry? Was Hope the last we’d ever see of them? Certainly not. At episode’s end, they were quarantined, not deleted from the database. At some point, Eli would have no doubt found a way to address any potential threat and re-upload them to Destiny’s mainframe. That was one possibility. Another deliciously diabolical idea Brad came up with would have been a huge game-changer. In this scenario, Eli goes to awaken the crew from stasis and discovers Chloe’s pod has been damaged. She is almost brain dead and fading fast. In a desperate, last ditch effort to save her, Eli downloads Ginn’s consciousness into her body. Would he tell the others what he has done or would Eli attempt to maintain the subterfuge? What effect will this have on the rest of the crew, especially Scott who has effectively lost Chloe but will always be reminded of what he had. And how will he react to the sight of the body of his former love, now permanently occupied by Ginn, re-establishing a relationship with Eli? This would have been huge and, I think, an awesome opportunity for the immensely talented Elyse Levesque to switch gears to play a completely different character. Answer: Fingers crossed for you and hubby, Lisa. Please keep us posted! Answer: The answers to those questions lie with MGM. Only they can decide when to revive the franchise, under what circumstances, and who would be involved. sg1efc writes: “My white german shepherd is getting his toe amputated at the knuckle tomorrow, cancer ate the bone away. Answer: Best of luck to your dog. Let us know how it goes. Answer: Sorry. That’s not going to happen. 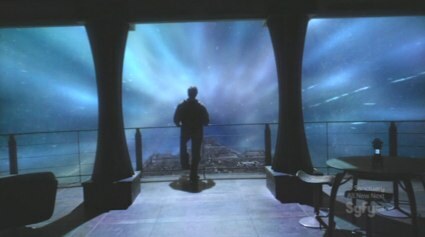 Even though we’d struck the SG-1 and Atlantis sets, I still held out hope for both movies because, in the case of Stargate: Revolution, the lionshare of the action would have been off-world and ship-based while, in the case of Stargate: Extinction, although there was some action on Atlantis itself (eminently achievable through the magic of VFX), much of the story takes place on Earth and off-world. In the case of Universe, however, most of the action would take place on the Destiny set which is in the process of being de-rigged as a I write this. Tanja, back at the production offices, reports that Stage 5 that once held the SGC and, later, Icarus Base, now sits empty. Sad. Answer: Don’t know. Maybe you should contact their webmaster to find out what’s up. Answer: Initially, Odyssey’s secret mission was tied to the search for a naquadria-rich planet capable of providing the energy needed to dial Destiny. Answer: This subject (the revelation and its many implications) would have formed the plot for the planned SG-1 movie, Stargate: Revolution. Flor also writes: “If i remember correctly, Air takes place a few weeks after EATG, meaning early 2009. That makes Gauntlet early 2010. Answer: Franklin was subsumed by the ship, his engrams (brain patterns) incorporated into the mainframe to form the default for the ship’s developing A.I. Which is why, unlike Ginn or Perry, he is not so much Franklin as he is an emotionless embodiment of Destiny itself. Answer: Eventually? Sure, it’s possible, but that wasn’t one of the scenarios we had planned for the show’s third season. Answer: I put your comment in moderation because I suspected this was faked. Unfortunately, I don’t have an HD copy of the episode with me in Toronto and the versions I accessed online are too dark. I sent word back West for what I believed would be proof discrediting the still. After all, I figured, would someone be so stupid/ignorant to do something like this and think no one would eventually notice? Well, it pains me to report that it isn’t a fake. And so, as one of the show’s Exec. Producers and the one on the front lines of the internet, it falls on me to offer an apology to all of our French fans who have been nothing short of fantastic in their support of the franchise. I am, and you’ll excuse me as I go off here, mighty pissed-off as, not only someone who has appreciated the French support our show and this blog have enjoyed over the years, but someone who grew up in Montreal, a multicultural and bilingual city, speaking French from fourth grade on. How the hell did we miss it? No excuses. I don’t know. In the past, certain things have gotten past us. There was the infamous Snickers bar in SGA’s The Ark. There was the boom mike in SGU’s Space. And, most memorable of all, was the camera operator in the SGA season four premiere that we only noticed during the Day 2 mix – and only because eagle-eyed Martin Gero was the one to suddenly notice – in the opening scene, a bunch of medical equipment sweeps by followed by Weir on the gurney and, finally the camera operator bringing up the rear! In the case of this incident, we missed it and I’m sorry. Paul suspects that the reason it got by everyone is that the shot is actually a visual effect and that, whenever we watched it, rather than taking in other aspects of the room, we were focusing on the set extension behind the approaching Chloe to make sure it worked – thereby missing what was right in front of us. Answer: Damn, Don. Those are both excellent ideas. Answer: Our comic book series, Dark Matter (May 10, 2011: Thanks for the thanks! Transporter: The Series! My Comic Book series!) hopefully/eventually coming to a t.v. screen near you! Answer: At the time, they didn’t know anyone would be left out. Answer: As I already mentioned in this entry, that’s a story for Brad and/or Robert to tell. Rush isn’t just defined by his intelligence, though; it’s his Machiavellian use of it. What if Eli started down that same path? He’s standing on the balcony smiling because he’s got everyone right where he wants them. Eli’s had total control of the drones since he brought that one on to the ship. He’s kept them attacking Destiny, but not destroying it, so that everyone would have no choice but to follow his plan and get into the stasis pods. One of them “happened” to malfunction, so he wouldn’t have to go into stasis. Of course, one might wonder how he was able to control the drone attacks while simultaneously fighting them off. But the answer’s simple: he has an accomplice, Ginn. He didn’t keep her program in quarantine; he just wanted everyone to think that, so she could carry out her part of the plan covertly. Answer: A very cool twist – but not really our Eli. Answer: That’s what I wanted to play on in this episode, the fact that things are catching up with the seemingly tireless Colonel Young. He’s exhausted and, right off the bat, Wray notices and admonishes him, suggesting he get some sleep. Well, at episode’s end, he finally does get that long-awaited opportunity to rest his weary bones. Answer: I’ve posted plenty of behind-the-scene pics over the past four years. Just peruse this blog’s archives. Answer: That may have hampered us had we received the green light, but I believe the state of dvd sales is what really impacted the movies. Answer: Again, I can’t speak for the studio. If the sales figures on the pre-existing Stargate comic books make this an attractive proposition, I’m sure it’s something they’ll consider. Answer: I’ll have to double-check but I believe so – Terminal City. Answer: Well, since you asked nicely, I’ll tell you all about Stargate: Extinction next week. Answer: Uh, I never said I wasn’t going to answer fan questions (especially since I asked for them). I was simply pointing out that, regardless of the answers I provide, they won’t be canon and, at the end of the day, bear no more import than any alternate answers provided by you at home. Answer: At this point, I’m sorry to say, no. Answer: Don’t recall if we ever discussed this. It’s a question for Rob Cooper. Answer: The conceit was that the transfer had to be initiated and maintained from the send point and I had no problem with that. One of my biggest pet peeves is convenience, strokes of luck that end up benefiting our character. On the other hand, I don’t mind complications that make our hero’s life difficult. The former is lazy writing. The second is good drama. Answer: Everything we could do to save the series was done. Unfortunately, it’s out of our hands. Answer: Cool but not very realistic I’m afraid. Answer: At this point, it’s a very different animal but, creatively, just as fulfilling. As for where I’ll be next year – who knows! We’ll be finishing up production on the first season of Transporter: The Series winter of 2011. I have no doubt it will get a second season. Whether I’ll be part of that second year remains to be seen. Answer: I don’t we have a premiere date yet. Stay tuned! Previous Article May 11, 2011: Gauntlet! Next Article May 13, 2011: Okay, try to keep up! The Transporter Team! Dark Matter Ship Designs! Movement on the Anime Front! Stargate: SG-1 Season 6 Memories! Notes on Network Notes! And I Answer Your Stargate Questions! Will there be a box set of all SGU ? But, but, but…Joe…THAT’S what makes it cool! Eli doing something totally unpredictable! Ya know, love makes people do really crazy OOC things…I mean, just look at all the stuff Todd made me do!! Thanks Joe! It went well. He’s one of four finalists–another phone interview next week and then a face to face if he makes the cut down to two. This would put him in upper management in a bank in the northeast if he gets it. We should know something in three to four weeks. He also has another interview for a job here in town next week too so things are picking up. I totally misunderstood your last comment exactly in the same form as David Knowles. That was the root of my last comment on the previous entry. It was only when I went back and read it again this morning that I realized that you meant only that any solutions you gave us were speculative and from a certain point of view, no different that any speculation we could come up with. My only disappointment (other than the scandal thing, which I hadn’t noticed before now) was that the possibility of uploading was never even brought up in the episode. Surely Rush would think of such a thing? Maybe that would have cheapened the drama, but it seems like Young/Rush/Eli had to carry the idiot ball a bit not to mention it. I also wondered about them eating and drinking before statis. There’s going to be a big line for the bathroom when they get out. Also would you really have approached Corin Nemec to reprise his role? In any case thank you for answering my other questions in the post. All I can say is and :_( —> That last one is with a single tear drop. Wow…I personally wasn’t sure I wanted to know what was gonna happen next but now…AWESOME! Eli fixes the pod in time BUT, somehow, he unknowingly erases or cancels the wake up call, leaving them all in perpeptual stasis permanently. As for Earth, they kept trying to communicate with Destiny for a full year when they were supposed to come out of stasis but they get nothing. The President officially writes them all off as permanently MIA, the Airforce and SGC send condolences to their families and re-focus their efforts on their ‘war’ with the Lucian Allience. There, simple and to the point. Painful but logical. Will they ever get out of stasis one day? Hopefully. Untill then, they can sleep in the void on their unending voyage. Peacefully and together…as a family. Also, thank you for everything. For SG-1, Atlantis and Universe. Looking forward to Transporter, your comic books and anything else in the Mallozzi pipeline. Re the French thing, someday you’ll be able to look back on it and laugh…no? No? Hey, it’ll end up being a part of Stargate trivia at cons for years to come. I can see why it makes you mad though. @Whether I’ll be part of that second year remains to be seen. Just wondering Joe, why wouldn’t you be a part of the shows second season? I highlighted this part of your answer to Tammy as I was more curious in knowing. So are you planning to join another show, or another project? Or is Toronto not growing on you? Can’t imagine your job not being secure on Transporter, you were one of the best Stargate writers out of everyone involved in the 3 shows. @ Bailey – No Sheppard? That’s because Todd ate ‘im! First I wont to say how much I enjoy reading your blog and how much I have enjoyed all three show SG-1,SGA, and SGU I have to say I like SGU the best and was really upset when I hear it was candled. I really hope we will see more of the Stargate universe in the future. I did have a question for you did you are the other ever think of the dimities of the Destiny how big it was? I am sorry that I misunderstood your last posts. Thanks for at least putting some of your ideas on the table. Now what do we have to do to get Martin or Brad to spill the beans on how the show was meant to end and what was Destiny going to fine at the end of her mission. I feel sorry for you and the production crew that somebody decided to try and ruin the final episode with that stunt. Okay I am sure the maths on the wall offend every scientist who knows anything about maths, but the comment about the French really was not needed for the show. Hopefully it will be corrected by someone at MGM before the DVD goes. Your Dark Matter comic, just wondering if is Scifi and is there anything about the plot, either in one of your previous blogs or somewhere on the web. Also wondering if getting into a TV is a dream that you would like to fulfill sometime in the future or is it something you are actively working on at the moment when you have time away from your transporter show, which I hope is successful when it airs. Very cool wrap up Q&A to SGU. It may not be canon, but it’s definitely a fun read for fans. Especially when we probably won’t see any follow-ups from MGM to this version of Stargate before they reboot the whole thing. Hi Joe. I found this blog entry extremely cathartic, since it helps me imagine endings to Destiny’s story. do you think that could be beneficial at all? MGM should have more confidence in their second largest franchise. Mr Joe, how much would it cost to have Kino episodes with Just Eli trying to fix the problem with the stasis pod, and other such adventures? Personally, I dislike all time travel, and hallucination episodes. If what you described was what we supposed to be S3E1 (Rush dreaming/hallucinating), then I’m glad is not there. I prefer episodes like “Light” or “Darkness”, or “The Greater Good”, and “Malice” that deal either with scifi drama, or realistic, hard-scifi situations (realistic survival, realistic alien life etc). But all the hallucination/time-travel episodes (e.g. Time, Pain, Cloverdale, descendants episodes) I don’t like at all. Not even a little bit. These are episodes that are carpet-pulling and they don’t move the plot forward anyway. But OK, so he ate poor Sheppard, now I want to see (fat and happy) Todd in the crossover! No. No. No!! Isn’t that what you did with Carter? She should have married Jack. Damn! Get Mr. Cooper on the line! All the writer’s ideas were fantastic. Too bad. SGU was just getting started and They pull the plug. Idiotic. Big post today! It is taking me forever to read everything. Wowzer! That was some meaty Q & A today. I’m excited about seeing the last SGU but I have to wait for hubby. Or….. I could watch it while he is gone and fake my reactions…. . I love Spoilers. Thank you, for correcting my grammar. The Aleve didn’t help and I had to move up to Imitrex. I’m feeling a little stoned . sg1efc: Good luck with your dog. Dogs are amazingly resilient when it comes to amputations. Where a person gets depressed over losing a hand, a dog might wake up after surgery and beg for food. Will your pup receive chemo? Das: Todd would NOT eat Sheppard! I’m sorry that all of you are going through the “French Incident”. I hope it doesn’t ruin all the good for you, the cast/crew and Mr. Binder. I had several questions hopefully in time I can get some answers or at least good questions most of them are about the franchise but I did have one just about SGU. Was there ever any discussion of resolving the DHD problem Or bringing on races similar to that of Atlantis? 1) It’s well known that the cast and crew got along very well and played jokes on one another. It is quite possible that this is the case the ‘writing on the wall’ was meant to trip up Carlyle given how he turns to face Elyse in the scene. Yes it is immature/dirty humour, but anyone who has worked in a tight knit group knows that that kind of thing goes on. It’s never talked about outside the group because it is very much a “you have to be there” kind of thing. It’s humour that is meant only for those involved and unfortunately in this case, it made it’s way on-screen. I have a difficult time thinking that there was any true malice intended. 2) Re-watching the scene it almost looks like that isn’t the whole text as there is another character after the word ‘French’ so we may not know (and never will with the sets now struck) what the whole thing said until the person who did it steps up. 3) It is entirely plausible that the editors missed this in post. Given that the set involved was not a new one, and that likely only a handful of people were involved in ‘decorating’ the walls with the equations, the focus of the editors would not even bother looking twice at the text and focus on the pacing/lighting/interaction of the characters. I’d watched the episode a couple times now before even reading about this issue today. It is unfortunate that this has marred the end of a good series and franchise. On other boards, those who reviled the series are using this issue as one more thing to suggest the show sucked and that the franchise should be rebooted (that being an idiotic idea in itself – too many reboots already and Stargate doesn’t need one). Certainly the ‘joke’ is not excusable to have made it as far as it did as it casts a dim light on a great production and people. I’m sure as this spreads throughout the interwebs those of the cast are going to weigh in on it as it comes to their attention. It will be curious to see if an explanation ever is revealed. I doubt it will ever satisfy the nay-sayers (much like Obama’s birth certificate hasn’t really shut up Trump or the birthers) but hopefully those of us who are real fans and of broader mindset can see past poor-taste pranks and wish well for the future. Hmmmm. Just say “pretty please”. Is that all it takes to get something from you around here? If he did, Ronon would kill Todd. Great post. I really enjoyed all your different season 3 possibilities.